Ericksen-Bronze_Star.jpgAction at LZ St. GeorgeRick is awarded the Bronze Star with "V" device for valorous action in the defense of firebase LZ St. George. The enemy attempt to overrun the base was defeated. Rick_E_1-4.JPGNot unionizedThis may look like a break, but it isn't. Rick_E_2-1.JPGWhat is it?I don't know, but they say it's "new and improved". Hope that M-16 has the safety on. Rick_E_2-2.JPGThe Blonde BombshellCpl Jim "Tex" Shelton and PFC Rick Ericksen seemed to enjoy escorting this radio and TV personality actress Chris Noel around the firebase. Well...at least it beats KP. I know no one is looking at it, but immediately behind the 3 is the 1/14th Infantry VIP briefing tent and it had some captured VC/NVA weapons and equipment on display. I found a 8mm film that I took of Chris getting off the helicopter and being escorted to the 1/14th by LTC Robertson, 1/14th CO but can't get digital images from the film that are viewable. Chris_Noel.jpgMs Chris Noel - Visiting CelebrityWell! Here she is today...meet Ms Chris Noel! Courtesy of that ubiquitous social media known as "Face book". 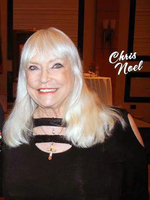 Fast Forward to 2014: model turned actress in the early 1960s, Chris Noel was a young blonde bombshell with a number of movies and TV guest appearances under her belt when she first started entertaining the troops in Vietnam. She received the Distinguished Vietnam Veteran award in 1984 from the Veterans Network for her work during the war. In an interview, Noel recalls her life-altering experiences and her ongoing efforts in support of Vietnam veterans. Line_Up_Men!.JPGAttention!Okay, guys...the Donut Dollies are here! Look, but do not touch! Dollies-1.JPGDonut DolliesWow...you didn't see this very often in a combat zone! They're out of uniform, but we let them ride in our truck anyway. As of November, 2014, we know that the Dolly in the middle is Margi Ness. Dollies-3.JPGStateside?These Donut Dollies take in a little bit of sun (which we had plenty of). If it weren't for the sandbags, you'd think this was a backyard photo.